The City of London is creating a policy framework to facilitate and inform the future development of the Masonville Transit Village. 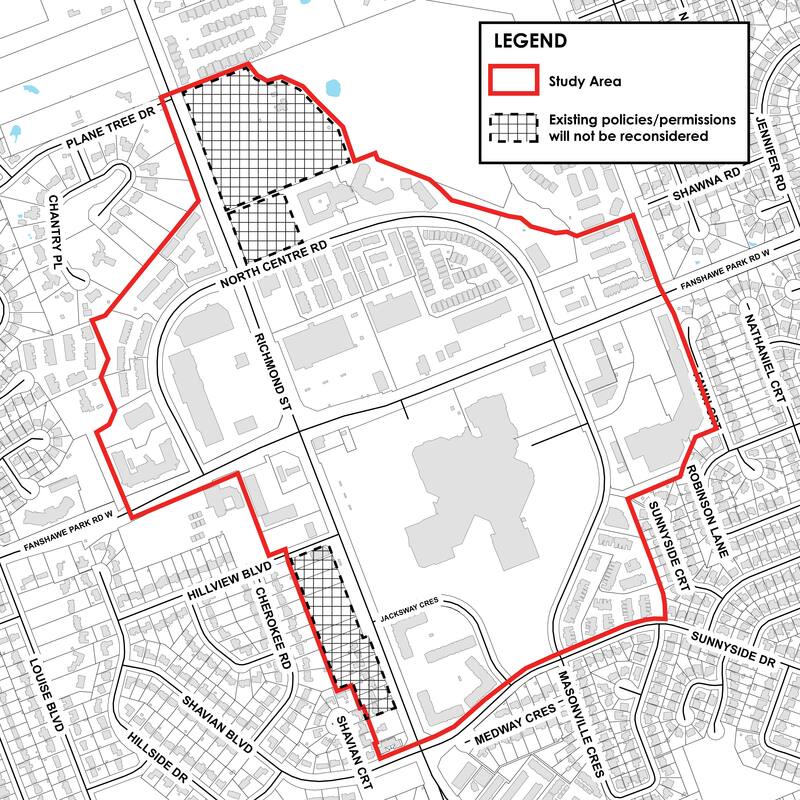 What is the status of the Masonville Transit Village Secondary Plan Study? The first Community Information Meeting will be on Wednesday, March 27, 6:30-8:30 p.m. at the Church of St.Jude, All Saints Hall - 1537 Adelaide Street North. View the meeting notice. Why are we doing a Secondary Plan for the Masonville Transit Village? The London Plan identifies four Transit Villages, which are intended to be exceptionally designed, high density, mixed-use urban neighbourhoods connected by rapid transit to the Downtown and to each other.These Transit Villages are intended to support intense forms of mixed-use development. While these Transit Villages are located in existing built-up areas, these locations have opportunities for significant infill, redevelopment, and overall more efficient use of land to support transit. The lands around the intersection of Richmond Street and Fanshawe Park Road, including lands fronting on portions of North Centre Road and Sunnyside Drive, in the Masonville neighbourhood are identified as one of the Transit Villages in The London Plan, referred to as the “Masonville Transit Village”. The Transit Village Place Type permits a broad range of residential, retail, service, office, cultural, institutional, hospitality, entertainment, recreational and other related uses, with a range of permitted heights between two to 15 storeys, up to 22 storeys with Type 2 Bonus Zoning. Mixed-use buildings are also encouraged. Currently, the area within the Masonville Transit Village is primarily occupied by low-rise retail, attached residential uses and large expanses of surface parking. It is anticipated that the area will undergo redevelopment through infill and intensification over time to realize the vision of the Transit Village Place Type. The development of a Secondary Plan is intended to provide a greater level of detail and more specific guidance for the Masonville Transit Village than the general Transit Village Place Type policies, to create a plan for the future development of a Transit Village that is unique to the Masonville community. The Secondary Plan will also address issues of compatibility and transition to existing uses within the Transit Village and the surrounding neighbourhood. The development of a Secondary Plan allows for a proactive and coordinated approach for evaluating future development. It is anticipated that secondary plans will be developed for all four Transit Villages. The Masonville Transit Village, given the recent development pressure in that area, will be the first of these four Transit Villages to undergo the development of a Secondary Plan. What are some of the questions the Secondary Plan seeks to answer? How can connectivity be improved throughout the Transit Village in the future? What is an appropriate built form to allow high density development and transition to the surrounding neighbourhoods? How can the area be designed to support transit? What is an appropriate land use mix? What community services and facilities would be required? Where should parks and publically accessible open space be provided? How can the provision of a range and mix of housing types be encouraged? What infrastructure will be required to support the community in the future? How can the effects of traffic and parking be mitigated? How can the Masonville Transit Village be developed in the future as a complete community? What does this look like? What are the Terms of Reference for the Study? Municipal Council adopted the Terms of Reference for the Masonville Transit Village Secondary Plan at its meeting of January 15, 2019. The Terms of Reference can be found in the Staff Report to the Planning and Environment Committee, January 7, 2019. The Study Area consists of all lands in the Transit Village Place Type in the Masonville community. Certain properties within the study area are identified by hatching in the above map. The existing policies and permissions for the areas identified in hatching will not be reconsidered as part of this study as these sites have recently been considered through Official Plan and/or Zoning By-law Amendment applications. These existing policies and permissions will be incorporated into the Secondary Plan. What is your vision for the future of the Masonville Transit Village? How would you like the area to evolve? What are some key opportunities for the Masonville Transit Village for the future? Is there anything missing that should be addressed? Is there anything missing in your neighbourhood? How can we best engage you in this study? What opportunities and considerations do you believe should be reviewed in the Secondary Plan study? How do you travel around the area? Are there pedestrian connections you wish existed that do not exist today? Use our interactive map below to tell us where you think pedestrian connections need to be added or improved to increase connectivity in the study area. Where would intensification (mid-to high-rise buildings be best suited within the study area? Use our interactive map below to tell us where you think mid- to high-rise buildings should and should not go. Click "Add a Marker", select a location on the map, describe what you would like to see at that location in the “Comment” box and choose "Yes" or "No" to indicate whether or not you think this location would be appropriate for mid- to high-rise buildings. Additional Community Information Meetings and a Walk and Imagine My Neighbourhood Tour will be scheduled in the coming months. Staff are happy to hear your ideas for other engagement opportunities! Please contact Michelle Knieriem (mknieriem@london.ca) with your ideas. The purpose of this meeting was to provide information about the Secondary Plan study and to get feedback on key opportunities and considerations for the development of the Secondary Plan. Visit the Engagement tab to see a list of upcoming events in your neighbourhood. The Church of St. Jude, All Saints Hall - 1537 Adelaide St. N.